The president signed the bipartisan Every Student Succeeds Act (ESSA) on December 10, 2015. ESSA comprehensively updates the Elementary and Secondary Education Act for the first time since 2001, including establishing a new Preschool Development Grants program (ESSA PDG) that is designed to help low income families gain access to high quality early learning opportunities. The new program, championed by Senator Isakson (R-GA) and Senator Murray (D-WA) succeeds the Administration’s Preschool Development Grants program (Legacy PDG), which, over the past two years, provided initial preschool funding to 18 states. Congress and the White House established the legacy program through the fiscal year 2014 federal appropriations process, referencing the 2009 American Recovery and Reinvestment Act’s innovation authority as a general basis for funding the initiative. This appropriations-based approach lacked detailed statutory guidance and instead reserved most Legacy PDG program decisions to the Department of Education and Department of Health and Human Services. ESSA, on the other hand, specifically defines the ESSA PDG program’s purposes, parameters, and other requirements. 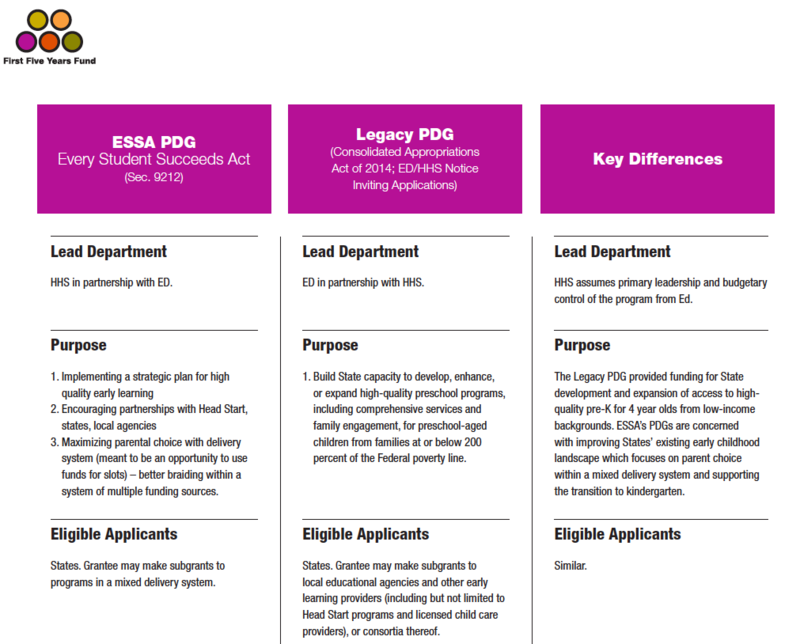 Download FFYF’s comparison chart detailing key differences between the Legacy PDG and ESSA PDG programs to help navigate the implementation process and transition to the new program.